The recently held International Mathematics Wizard Challenfge (IMWiC) held in Thailand became the medal harvesting field of the Filipino youth. 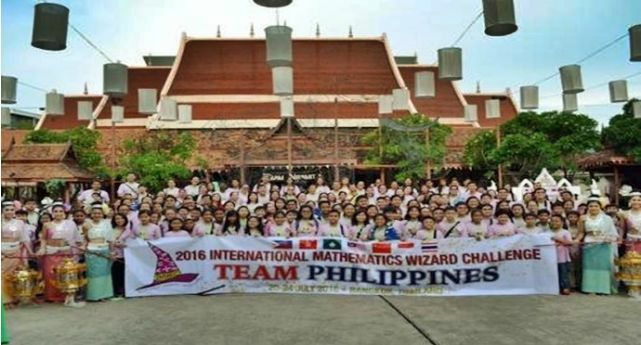 Elementary and high school students won 240 medals for the Philippines and the country placed 2nd overall behind China in the international math tournament held in Bangkok, Thailand. The haul consisted of 34 gold, 74 silver and 132 bronze medals. Another 87 merit awards were also awarded to the Filipinos. The countries that participated included China, Hong Kong, Vietnam, Macau, India, Indonesia and Malaysia. Marco Paulo Frois Rodrigues - Rainbow of Angels Learning Center Inc.
Allen Prado - Mother Goose Special School System Inc.
Moriah Murillo - Jesus Is Lord College Foundation Inc.
Arabella Gaile Ildefonso - Statefields School Inc.
Charles Patrick Salome - Statefields School Inc.
Bianca Marie Lim - Jesus Is Lord Colleges Foundation Inc.
Najela Anne Magbanua - Doane Brilliant Child Learning Haven, Inc.
Anika Bettina Bonifacio - Mother Goose Special School System Inc.
Martin Lorenzo Bustos - Palm Springs Montessori Integrated School Inc.
Andrei Jonas Jose - Dr. Yanga's Colleges Inc.
Ralph Ernest Argana - BHC Educational Institution Inc.